If you know anything about ductless mini splits, you probably know the basics: they can heat and cool your house, they’re energy efficient, let you customize temperature zones, and—best of all—give you low energy bills. But that’s not all they do! There are other great benefits to having ductless mini splits, and one of the biggest benefits is better air quality. Especially for people with allergies, mini splits can make a big difference in how you breathe in your own home. Unless you or a loved one has severe allergies, you probably don’t think about air quality all that much. As long as you can breathe it in, you probably think that the air quality is good enough for you. But if you suffer from allergies or asthma, high air quality becomes crucial. And even if you don’t, what you breathe in is more important that you know. Poor air quality in your home can cause headaches, fatigue, and even sinus congestion. Most homes have air that is filled with allergens, pollutants and contaminants. Ew. Over time, things like pollen, dust, and dander build up in your home and the air. Not only is this gross, but it can trigger asthma attacks or intense allergic reactions. What does my HVAC system have to do with this? 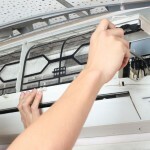 Well, the heating and cooling systems functions by pushing around air. Because your HVAC system pushes the air around, it can contribute to the poor air quality in your house. Pollutants and allergens can even get caught in the ducts of your HVAC systems and make the air quality even worse! This is where mini splits come in! The first and foremost way that ductless mini splits are poised to help improve air quality in your home is right in the name—they’re ductless! By eliminating ducts—the spots where allergens and pollutants gather—mini splits don’t harbor these molecules that pollute the air. Simply by installing ductless mini splits, you are immediately improving the air quality in your home! What Do Instagram and Mini Splits Have in Common? Filters! Having removable filters is another great way that mini splits help improve the air quality in your home. All mini splits have filters that you can remove and clean or replace. This can either be done by you or by a professional to ensure the most thorough job. Mitsubishi Electric mini splits have a special triple filter technology and continuous fan operation that gives your house incredibly clean air by filtering the pollutants out of the air with increased filtration. If the air quality in your home has been affecting you or your family members, then make sure to check out how ductless mini splits could drastically improve the air in your home. Contact Total Comfort HVAC at 401-533-3302, 774-284-3585 or email us at info@totalcomforthelp.com to see how Mitsubishi ductless mini splits can help you breathe a little easier.